WASHINGTON — Ryan Johansen had a goal and two assists, Viktor Arvidsson and Rocco Grimaldi each added a goal and an assist and the Nashville Predators scored four unanswered goals to break their six-game losing streak with a 6-3 win over the Washington Capitals on Monday. Pekka Rinne stopped 22 shots for the Predators as they ended their longest skid since an eight-game slide from April 4-19, 2013. Michal Kempny opened the scoring with his fourth goal of the season at 4:33 of the first. The Capitals took a 2-0 lead four minutes later on Jakub Vruna’s 12th goal, which was followed 23 seconds later by Nashville’s Grimaldi’s second goal of the season. NOTES: Capitals F Alex Ovechkin hasn’t scored a goal in his past six games, his longest streak without a goal since Nov. 10-20, 2017. … Grimaldi and Salomaki hadn’t scored since Nov. 1. … Holtby received an assist on Stephenson’s goal, his second of the season and the 10th of his nine-season career. … Capitals D Brooks Orpik returned after missing 26 games with right knee surgery. … Washington sent D Tyler Lewington to Hershey (AHL) two days after he scored a goal, received an assist and got in a fight in his second NHL game. 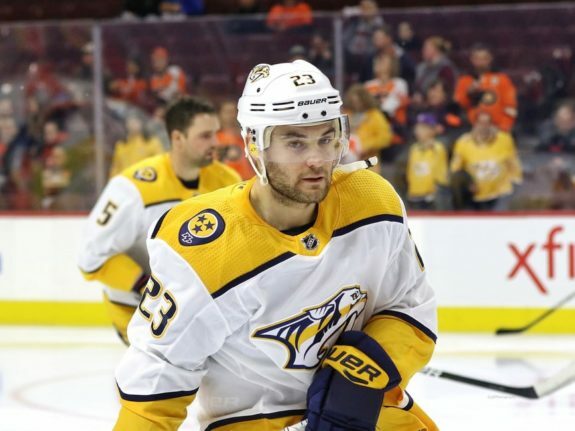 … Nashville recalled F Nicholas Baptiste from Milwaukee (AHL), but he was a healthy scratch. … Predators F Kyle Turris missed his second straight game with a lower body injury.